Car Rental Strasbourg Airport | Special Offers On Sml, Mid, Lge Vehicles! Part of either France or Germany depending on the historical and political era you’re looking at, Alsace reveals its dual heritage and yet is truly distinct as its own cultural phenomenon. Streets dotted all over with French flags demonstrate the current sentiment of Alsatians being proudly French. The architecture has prominent Gothic and Roman influences and the more rural areas are simply stunning – perfect for a jaunt in your car or 8 seater minibus rental in Strasbourg. Choose from among national providers like Avis, Hertz and EuropCar for a trip of a lifetime. The beautiful capital city of Strasbourg is home to the Council of Europe, the European Court of Human Rights, the European Ombudsman, the Eurocorps, the European Audiovisual Observatory and also the European Parliament. It is also renowned for its historical centre Grande Île – which was also the very first city centre to be classed entirely as a UNESCO World Heritage Site. Strasbourg makes an excellent base for the serious wine connoisseur. The Alsatian Vineyard Route, which winds from Marlenheim just 30 minutes north of the capital to Thann in the south and Mulhouse in the east, is nothing less than a pilgrimage in your car hire in Strasbourg Airport. 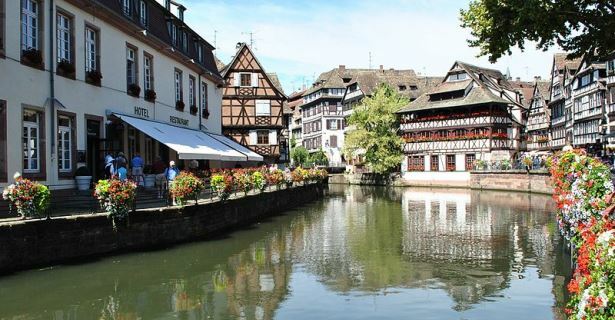 Also recommended is a visit to the Riquewihr Traditional Winemaking Village or a long leisurely drive on the Route du Vin, or Wine Road – stop when the moment takes you to explore the many little wine towns and villages (67 in all) – en route in your Strasbourg car hire. Alsatian cuisine is truly unique. Traditional French flavours are given a distinctive German flair, and the German staple, sauerkraut, was invented here and is known as choucroute. Also try the tarte flambée (or flammkuchen in German), a kind of creme fraiche pastry with bacon and onion, or the local crème brûlée. Boasting the largest number of five-star chefs relative to its population, you can relish snails, charcuterie and other abundant delicacies. Time your trip by minivan or car hire at Strasbourg Airport for the end of the year to make the best of the traditional Christmas markets, where warm, spiced wine and cookies will cheer you right up. Germany is famous for its dazzling and aromatic Weihnachtsmärkte made more festive by choirs and brass-bands. Major German cities like Stuttgart, Frankfurt and Munich are only 90 minutes, 2 hours and 4 hours away by car rental at Strasbourg Airport, respectively. No visit to the region is complete without a special road trip through the Vosges mountains and along the Rhine valley. If you have children, you might consider having a look at the Orangerie, a gorgeous park and zoo with birds and animals and a playground that younger kids will love. Stockfeld is another beautiful garden city in the South-East of Neuhof and an excellent way to spend the day. If you have plenty of time, you can pack in more popular destinations with your car hire from Strasbourg Airport. Paris, for example, is only four hours away, and its financial hub sister, Lyon, less than five; with one way car rentals being available. Since Strasbourg sits right on the German border, your car hire from Strasbourg Airport will also bring you to smaller border countries like Luxembourg, three hours to the north; Switzerland, the same distance to the south; and the Ligurian coast of Italy, four more hours farther south. From the Italian Riviera, you can have the option to go southwest to Monaco and then follow the French Mediterranean coast for celebrity-sighting in Cannes, or a sun-and-sand holiday in Nice and St. Tropez.